It should go without saying that a modern kitchen should evoke the embodiment of sleek design, and smart concepts to make for the best use of the space you have to work with. But with so many inspiring modern kitchen ideas, how do you narrow everything down so its right for you? Creating a stylish and beneficial kitchen design that’ll make your time spent in it all the better should be your ultimate goal. So, to help you find the best ideas for your home, we enlisted Décor Aid interior designers and renovation experts to help you on your way. After all, since its one of your most commonly used rooms and can be quite the investment to get right, these modern kitchen ideas are sure to show you some inspiring tips to get yours right. 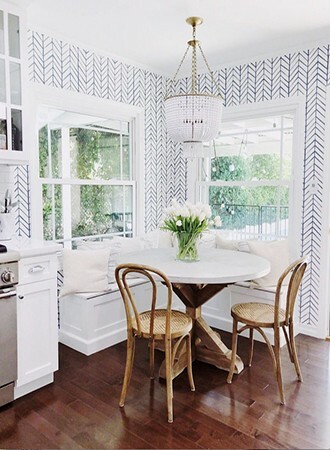 Sure, wallpaper may seem like a throwback, but have you seen how innovative modern wallpaper prints are as of late? Thanks to new printing technologies, you can easily have custom wallpaper featuring just about any design or motifs created to make your kitchen feel all the more modern, and one of a kind. Go for bold and bring in a graphic large scale printed wall covering or go in a more demure direction with a delicate micro-pattern. In essence, the sky’s the limit, but just be sure that your new kitchen wallpaper features colors that you’ll be happy with for years on end as it can be a costly investment that you won’t be happy having to spend on recovering, any time soon. For a more open feel while making your space feel brighter and tidier, instead of bulky upper kitchen cabinets, think about going for a more clean and minimal look by completely skipping out on cabinets above your countertops. This will give you space to have open shelving installed, will make your ceilings look higher, and will keep the overall feel of your kitchen lighter in appeal. 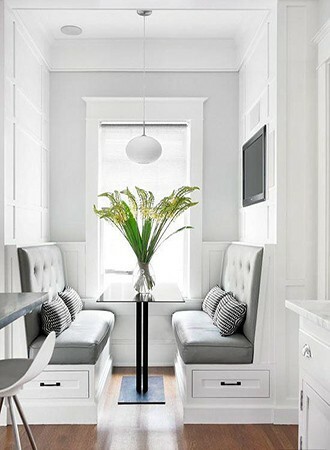 For an inviting and cozy feel that’ll also boost the value of your home, consider having a custom kitchen banquette feature built into your space that you” enjoy for years to come. And best of all is the additional storage features a smartly designed custom kitchen banquette will lend to the space to help you keep it cleaner and organized on a daily basis. For a delightful sense of everyday glamor, think about adding dramatic high-shine surfaces when deciding on the best modern kitchen decor ideas for your home. This could be something as affordable as a mirrored wall, reflective surfaces or even better, reflective polished kitchen cabinets. By going for ornamentation and slick shiny surfaces, your kitchen will instantly look larger than it is, and endlessly luxurious and expensive to boot. Just like high-shine surfaces, gorgeous glass front cabinets will also make your kitchen look larger while making it feel all the more expensive. They can be a costly investment, so make sure that the design and style of yours will only add to the value of your house. Besides being able to display what’s inside, you’ll also be able to find what you need much faster. With soft, soothing, and timeless makeup colors continuing to trend in the world of interior design, neutral tones make for a great alternative to white kitchens for a more unique look and feel. For your home, modern kitchen ideas call for subdued and palette cleansing soft tones and unobtrusive accessories that will make your kitchen feel more intimate and warm. Keep it minimal and keep it cool. Think muted pinks, beiges, corals, and creamy shades rather than going for bold and colorful – modern kitchen decor ideas are all about a more discreet style. Simple kitchen cabinets in subdued shades are sure to look great with a timeless glossy marble countertop, unexpectedly masculine hardware for juxtaposition, and simple statement lighting. Black and white always makes for a classic kitchen combination, but just because it’s a classic, doesn’t mean the striking color combo can’t be one of the best modern kitchen ideas for your unique home. The classic route would have been all-white kitchen cabinetry paired with black granite countertops, but for a more modern take on this pairing, switch it around. Go for black cabinets and a stunning white worktop, or even go for all black and break the look up with a contrasting white kitchen island. For modern kitchen island ideas, we love white marble with an overhang for a breakfast bar – perfect for entertaining. Plus, darker kitchen cabinets will hide everyday wear and tear better than lighter or a more natural finish will. An all-white space is probably what first comes to mind when you think of modern kitchen decor ideas, and it makes sense, especially if you are looking to secure the resale value of your home. All-white kitchen designs make for a clean and flowing space, which is great for small modern kitchen ideas, as the color allows you to make your space feel as large and bright as possible. There is something so relaxing about an all-white space and you can break up the white with a statement accent wall and printed or patterned accessories like rugs and linens. Choose white cabinets without any handles for the cleanest and most modern look possible (plus, it stops the space from feeling cluttered which is perfect for minimal small modern kitchen ideas). If you love the idea of an all-white kitchen, but the stark appeal of it seems limiting for your home, then pairing up white cabinetry with dark wood accents is a stylish alternative that’ll answer your modern kitchen idea dilemmas. Choose dark wood shelving to be installed along a white tiled wall where you can display cookware and storage jars full of dried goods. Pull the dark wood through the rest of your kitchen with bar stools with wooden seats, a white kitchen island with wood paneling and wooden kitchen accessories. This pairing will warm up your kitchen and give it a warm and cozy feel, without having to shy away from modern kitchen decor ideas by going for too rustic country of a style. Wooden kitchen cabinets may sound like an old-fashioned idea at first, but new styles are anything but ordinary yet are still timeless. Modern kitchen ideas 2019 are full of sleek and minimal wooden kitchen cabinets, rethought and simplified to forgo the traditional feel while providing you with an on-trend and modern kitchen design that’ll look great for years to come. Wooden kitchen cabinets designed without handles will work wonders in your kitchen, giving you a clean, no fuss design. However, if you think an all wood kitchen will look too heavy for your space, break up the look by juxtaposing white kitchen cabinets along the floor with modern wood cabinets above your counter. Accompanied by a white countertop, your kitchen will be the epitome of modern kitchen ideas that everyone will take inspiration from. By going for a fresh take on traditional kitchen design ideas, you’ll also ensure that your update won’t take away from the potential resale value of your home. If you’re on the hunt for modern kitchen decor ideas that instantly evoke an awe-inspiring sense of alluring luxury, then a moody inky blue and white combination is sure to do the trick for years to come. The two make for a surefire route to everyday elegance as it’s a luxurious and stunning combination that’ll instantly turn any kitchen into a complete haven of stunning modern kitchen ideas. White kitchen cabinets topped with an inky or deep blue surface, or dark navy blue cabinets topped with a stunning white marble countertop, whichever combination you go for, it’s sure to look amazing. Accent the color combination with metallics details and hardware to add some warmth and depth to your kitchen along with a display of copper pans and kitchen accessories. Cool stainless steel makes for uniquely stunning modern kitchen ideas, especially when it comes to cabinetry. Whether you want to bring stainless steel in via appliances, cabinetry, countertops, backsplashes or even modern kitchen island ideas, it is sure to help you create a thoroughly modern feel in your space. Stainless steel will give you an industrial feel and teamed with white or grey accents, you’ll have a sleek and ultra-modern kitchen design to be envied. Allow the stainless steel to be a feature in its own right and don’t write the material off as something that is all practicality with no substance or style. Up the luxury level in your kitchen with high-shine metallic accents. A bold row of metallic pendant lights will make a huge impact in your kitchen design. Be bold and install a statement gold tap. Be brave and choose some chrome bar stools for your breakfast bar (a great way to give modern kitchen island ideas a boost). Mix and match your metallics – gone are the days of having to limit yourself to completely gold, silver, and bronze tones – you can involve all three in your modern kitchen design at once for a rich and endlessly elegant mix. When it comes to modern kitchens, they can often end up being cold and clinical, without any real character or texture, but this doesn’t have to be the case with a few needed additions. Allow your imagination to run wild and come up with modern kitchen decor ideas that boast different textures for added warmth and personality. If you don’t have much space to work with, textured white tiles are a great option for small modern kitchen ideas as they keep your space open but give you the opportunity to be playful with your design. Go for textured tiles, stunning marked marble, upholstered bar stools, metallic elements, and wooden touches for a kitchen full of character. Wall to wall shelving is a stylish storage solution for any modern kitchen and is a great way to display everyday items and accessories when it comes to small modern kitchen ideas. Not only does wall to wall shelving provide your kitchen with easy to access additional storage, but lengths of shelving like this are a great way to easily reach cookware, crockery, and any other everyday kitchen essentials you’d like to have on show. Make art out of the contents of your kitchen by displaying a curated selection of them on your wall to wall shelving for all to see. Just keep in mind that while they look terrific, they also tend to catch dust, meaning that you’ll need to routinely clean items you might not even use all that often. Suspended shelves aren’t something you see every day and our interior designers love how they add that little something extra and unique to your kitchen space. Not only do they give you additional storage, but they also do it in a way that exudes on-trend style and they are more like a work of art than a storage solution when you secure them in a chic manner. They are a great way to display your kitchenware and glassware and they add a wonderful, stylish industrial element to your kitchen. Statement lighting shouldn’t be reserved just for your more formal areas any longer. As when it comes to modern kitchen decor ideas the rules are in your hands. Be bold and brighten up your kitchen design with lighting that’s a little different and grander in design. Even if it’s ornate and large in scale, even the most regal of lighting options will always be practical when it comes to everyday use. Make an unforgettable and unique statement with large spherical pendants, modern sculptural lighting, or rows of recessed linear lighting like those seen in art galleries and museums.